TH E M R EP O RT | 21 FEATURE MCS Valuations is committed to providing the best possible service and most reliable value to our clients. 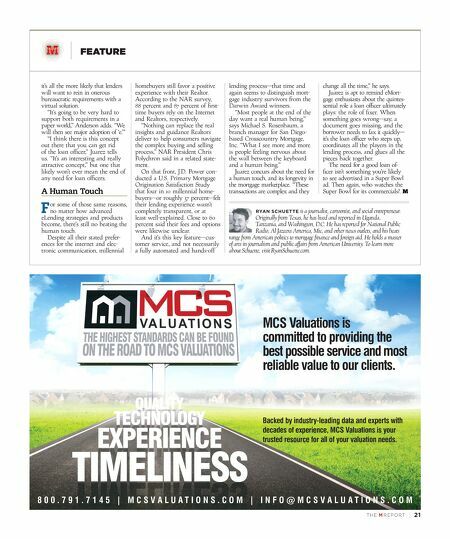 Backed by industry-leading data and experts with decades of experience, MCS Valuations is your trusted resource for all of your valuation needs. 8 0 0 . 7 9 1 . 7 1 4 5 | M C S V A L U A T I O N S . C O M | I N F O @ M C S V A L U A T I O N S . C O M it's all the more likely that lenders will want to rein in onerous bureaucratic requirements with a virtual solution. "It's going to be very hard to support both requirements in a paper world," Anderson adds. "We will then see major adoption of 'e.'" "I think there is this concept out there that you can get rid of the loan officer," Juarez tells us. "It's an interesting and really attractive concept," but one that likely won't ever mean the end of any need for loan officers. A Human Touch F or some of those same reasons, no matter how advanced eLending strategies and products become, there's still no beating the human touch. Despite all their stated prefer - ences for the internet and elec- tronic communication, millennial homebuyers still favor a positive experience with their Realtor. According to the NAR survey, 88 percent and 87 percent of first- time buyers rely on the Internet and Realtors, respectively. "Nothing can replace the real insights and guidance Realtors deliver to help consumers navigate the complex buying and selling process," NAR President Chris Polychron said in a related state - ment. On that front, J.D. Power con- ducted a U.S. Primary Mortgage Origination Satisfaction Study that four in 10 millennial home- buyers—or roughly 37 percent—felt their lending experience wasn't completely transparent, or at least well-explained. Close to 60 percent said their fees and options were likewise unclear. And it's this key feature—cus - tomer service, and not necessarily a fully automated and hands-off lending process—that time and again seems to distinguish mort - gage industry survivors from the Darwin Award winners. "Most people at the end of the day want a real human being," says Michael S. Rosenbaum, a branch manager for San Diego- based Crosscountry Mortgage, Inc. "What I see more and more is people feeling nervous about the wall between the keyboard and a human being." Juarez concurs about the need for a human touch, and its longevity in the mortgage marketplace. "These transactions are complex and they change all the time," he says. Juarez is apt to remind eMort - gage enthusiasts about the quintes- sential role a loan officer ultimately plays: the role of fixer. When something goes wrong—say, a document goes missing, and the borrower needs to fax it quickly— it's the loan officer who steps up, coordinates all the players in the lending process, and glues all the pieces back together. The need for a good loan of - ficer isn't something you're likely to see advertised in a Super Bowl ad. Then again, who watches the Super Bowl for its commercials?. RYAN SCHUETTE is a journalist, cartoonist, and social entrepreneur. Originally from Texas, he has lived and reported in Uganda, Tanzania, and Washington, D.C. He has reported for National Public Radio, Al Jazeera America, Mic, and other news outlets, and his beats range from American politics to mortgage finance and foreign aid. He holds a master of arts in journalism and public affairs from American University. To learn more about Schuette, visit RyanSchuette.com.